The Garden of Delights krautrock reissue label is still hard at work uncovering these half-forgotten recordings made in the heroic era of the 1970s. By now, perhaps it's not necessary to continue to point out the level of care and attention to detail that the label has bestowed upon these old works, not only producing high-quality digital masters, but also drumming up band histories (presented in both German and English), vintage photos, and in some cases short statements by the band members themselves reminiscing about the old days. Here are my thoughts on the latest three releases on the GoD label. Everything you need to know about the other 36 releases can be found elsewhere here on www.aural-innovations.com. When the Royal Servants (from the Göppingen area of southern Germany) decided to begin singing in their native language, they figured that they should have a German name as well. And because as the Royal Servants they'd already released the album 'We' in 1970 (GoD CD031), the band decided to dub their first release under their new name Eulenspygel '2' to some confusion. The change in language was really not such a big thing compared to the change in musical style. I found most of 'We' to be poorly-copied versions of contemporary music from the American west coast (Doors, Santana, Steppenwolf). Eulenspygel on the other hand was full of the quirky idiosyncrasies that made krautrock so wonderful, and hence '2' is actually a very good album! Musically, the mix is similar to so many of the other bands of this era, progressive jazz-rock rhythms, heaps of organ, some flute, and many different motifs lined up end to end to create complete tracks without necessarily any logical connection. And in that way, I always find this stuff to be great fun... hardly ever predictable! Lyrically (the translations are provided), the band was obviously very interested in liberal causes, because the songs are typically about the environment, capital punishment and over-commercialization. 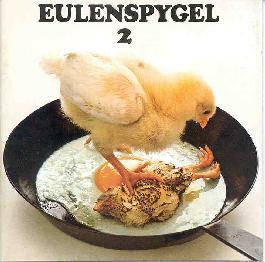 The album's cover (which was later changed by the record company) is obviously some sort of statement, showing a live chick standing in a frying pan over the sizzled remains of another chick. Compared to Royal Servants, the musicianship is also much improved even though the base lineup of guitarists Detlev Nottrodt and James Thurow, bassist Ronnie Libal, and drummer Gunther Klinger remained intact. However, the addition of organist Karlheinz Großhans and flute-player Cornelius Hauptmann helped give the unit crucial additional voices. Vocalist Mulo Maulbetsch was also new to the band, and because I find German-accented German as intriguing as German-accented English, I like his singing just fine. "Son My" is perhaps the most interesting track, an 11-minute peculiar composition with an excellent flute solo, and an odd, choppy "Magic Carpet Ride"-style jam in the middle. "Konsumgewäsche" is off the beaten track as well, ending up with a "Deutschland Uber Alles" organ finale. The 40-minute album signs off with the five-part "Das Lied vom Ende," a sort of microcosm of all the ideas going on in the progressive rock world at the time, including showing off Thurow's capabilities on the violin. Eulenspygel's next work was "Ausschuß," which is just coming out now on GoD... I'm really looking forward to hearing more of the same. Definitely recommended to fans of Kraan, Out of Focus, and other like-minded artists on the GoD label like Siddhartha and Morpheus. 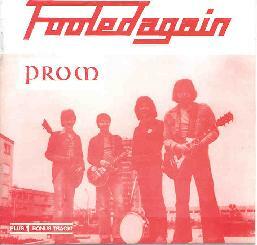 Prom were a dirty blues-rock band from the very southern part of Germany (bordering on Switzerland) that had gigged for awhile and then in 1978 recorded an album's worth of tunes in a local church. They had assumed that they had made a firm deal to have the album released on the New Blood label in Cologne, but the label reneged and soon folded, and so only the 78 vinyl copies that had been pressed were delivered to the band. Of course, few have survived and because of rarity alone, the album has been considered something of a collector's item. Well honestly, the songs are so ordinary and the recording so murky, that it's hardly worth the effort. But this CD re-release will hopefully save some from spending a whole ton of loot on something so unremarkable. Guitarist Uwe Karle is the one player that shows some talent here, and interestingly he was initially dragged out of the audience to play bass for one gig (their former bassist having just quit) and ended up joining full-time. The singer, Klaus Fallert, seems like he might have had a decent voice, but the fidelity of the vocal tracks is pretty rough and it's hard to tell. Probably the album's best track is "Blues," a very standard Muddy Waters-like delta blues number, so mostly an opportunity for Karle to shine on lead guitar. "Mogadischu" is their 11-minute opus, a mix of folk-rock and blues with a Freebird-style dueling solo excursion. It's easy to tell when Karle is playing lead vs. Fallert's tentative go at it, that's for sure! A four-minute bonus track (a Dylanesque folk tune) is thrown in to make it a 40-minute affair. But really an unnecessary 40-minute affair. I'm not sure this one should've kept its place in the GoD queue. 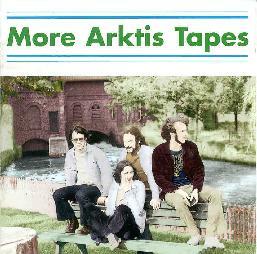 The fourth installment in the Arktis CD catalog is 'More Arktis Tapes,' following up on the earlier 'Arktis Tapes,' which differs in that it was actually an LP release back in 1975. This one is 70+ minutes more of scraps, jams, and the occasional song or two from the same sessions but that didn't make it onto that LP. Rather like the Prom archive, 'More Tapes' is primarily a vehicle for Klaus Blachut to wail endlessly on the guitar. And while some of it is rather tedious, there are some brilliant moments as well. Halfway through the disc, "Highlands" is seven minutes of twin-guitar bliss (presumably Blachut dubbed over himself). The opening track, "Picture," too is a wonderful psychedelic journey, this one an actual song with Karin T`ppig's vocals a welcome 'sight.' I love the odd contradiction in her voice, simultaneously feminine and heavily Teutonic (if that's possible)... too bad her vocals are half-buried in the mix here. The guitar work on "Picture" is excellent also, and the whole band jams together fluidly throughout the track. "Let the Music Play" is another real song with Töppig singing and it's a good one also, coming across like a honky-tonk Velvet Underground, though sadly it's only a demo-quality recording. The big problem is that very little of the remainder of the album is finished enough to fully enjoy. There are some really interesting passages in the 14-minute jam "Guitar Emotion," but it still drifts in and out of the realm of excitement. "Stepping Ahead" is another 14 minutes of jamming, and it's not surprising they rejected this from the original LP.... rather dull. The live version of the southern-fried "New Rock" (a song on the original 'Tapes') helps close out the album on a higher note, but from Arktis' catalog I still recommend starting out with the first (self-titled) album. However, I actually believe this one is at least as good as 'Tapes,' and I could see reworking the two into one really strong compilation and a good hour's worth of tape for the scrap heap. I don't think they made the best choices for the 'Tapes' LP seeing now all that they had to work with in 1975, but that's just what I think. Late 70s krautrock was a little schizoid, with some of the progressive concepts and psychedelic sounds being leached out of the music in favor of (presumedly) more commercially-acceptable flavors. While this meant that krautrock's identity was becoming watered down, some bands still managed to make quality albums. 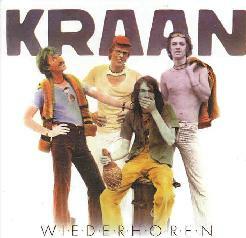 Kraan, a nomadic band that sprouted in Ulm, then travelled through Berlin and Munich, before finally settling in the small town of Wintrup, was one of these bands that retained at least some semblance of artistry. 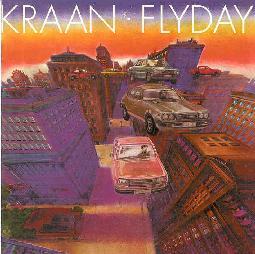 Here, on their fifth and sixth studio albums, we find Kraan embracing the slick jazz-rock style of the time that frankly I don't feel has aged so well. There's a quality to the sound that is so sunny and chipper that I can't avoid imagining passengers on a cruise ship sipping daiquiris in a Caribbean port. (Only without the steel drums.) Even so, compared to the agony of revisiting the jazz-disco of say, contemporary works of Maynard Ferguson, I found this time-warp journey rather rewarding. This was my first introduction to these albums, though because long ago I'd found vinyl copies of Steve Hillage's 'Open' and a couple of the Pierre Moerlen's Gong LPs, I have at least some perspective on the times. And I'd say these are at least as worthwhile. Both albums feature eight tracks and chime it at around 40 minutes each, and it seems as though they should've been able to squeeze both on to a single CD given the 78-minute variety. Stylistically, the two works fit pretty well together, though perhaps doses of 40 minutes at a time are preferable to an hour-plus. Keyboardist Ingo Bischof, who was relatively new to the band, is quite prominent (in a sense replacing the saxophone of Alto Pappert, who had just left Kraan) though guitarist/vocalist Peter Wolbrandt was still apparently the main force within the group. The main drummers changed between albums (from Jan Fride to Udo Dahmen), but both works feature a lot of extra percussion (congas, bongos, etc.) that is just as important to the overall mix... there's that 'island' feel again. I've grown to really enjoy Wolbrandt's breathy and melodious singing (a German Sting? ), and he's in fine form throughout both discs. He also throws us a curve both times with a taste of eastern chanting in the similarly-titled "Yagui Yagua" (on 'Wiederh`ren') and "Gayu Gaya" (on 'Flyday'). The latter is a very progressive (well... odd really) tune, bassist Helmut Hattler showing off some impressive bass runs and Wolbrandt kicking in a freaky guitar solo. More of these 'kraut' eccentricities show up earlier on 'Flyday' during "My Brother Said," making this album the preferable of the two. This despite the Sister Sledge-"We are Family" shtick over the silly jazz-funk of "You're Right." Yikes! Oh well, I'm sure it seemed like a good thing to try at the time! Flyday's title track is another winner though, a light airy melody with just Bischof's moog textures and Wolbrandt's licks and strums carrying the tune. Even with what I said earlier, I still think it's hard to judge these albums in a modern light. Oddly, I get more of a feeling of nostalgia when listening to this stuff as compared to the 1970-75 period (including Kraan's 'Wintrup'), music that I feel is timeless. And my opinion of some of the tracks have already changed... for instance, I originally wrote negative remarks about "Rund um die Uhr" (from 'Wiederh`ren') comparing it to George Benson's jazz-fusion. Well, that might be accurate enough but during my latest listen, I found myself really enjoying this tune and in particular Wolbrandt's crazy guitar runs. Still though, if I had to choose only one, I'd go for 'Flyday.' The 'old' Kraan just seemed to show through more here, even though this album was farther removed chronologically. Fünfundvierzig is keeping busy and will soon re-release 'Tournee' and 'Nachtfart' from the early 80s, and also a collection of rare and unreleased recordings under the title 'Berliner Ring.' The early 70s albums appear to be on their way back to the marketplace through EMI... in fact, the first self-titled album (plus bonus tracks) and 'Live' may already have been released. Good to see the Kraan back-catalog getting the attention it deserves. Contact c/o Fünfundvierzig, Schmiedetwiete 6, 23898 Labenz, Germany. Distributed in the US by innerSPACE Records. Snail mail InnerSPACE at P.O. Box 411241, San Francisco, CA 94141-1241.